Chunky Peanut, Chocolate, and Cinnamon Cookies are the third and final recipe in my “baking to freeze” series (see the introduction post here, if you missed it!). These cookies taste festive: cinnamon and spice, along with crunchy peanuts and rich chocolate chips. Ziplock of Chunky Peanut, Chocolate, and Cinnamon Cookie dough partitioned into 4-cookie logs, with thawing/baking instructions. Preheat oven to 350 degrees. Whisk together flour, baking soda, salt, and cinnamon in a medium bowl. Put butter and peanut butter in the bowl of an electric mixer fitted with the paddle attachment; mix on medium speed until combined, about 2 minutes. Add sugars; mix 2 minutes. Mix in eggs. Gradually add flour mixture; mix until just combined. 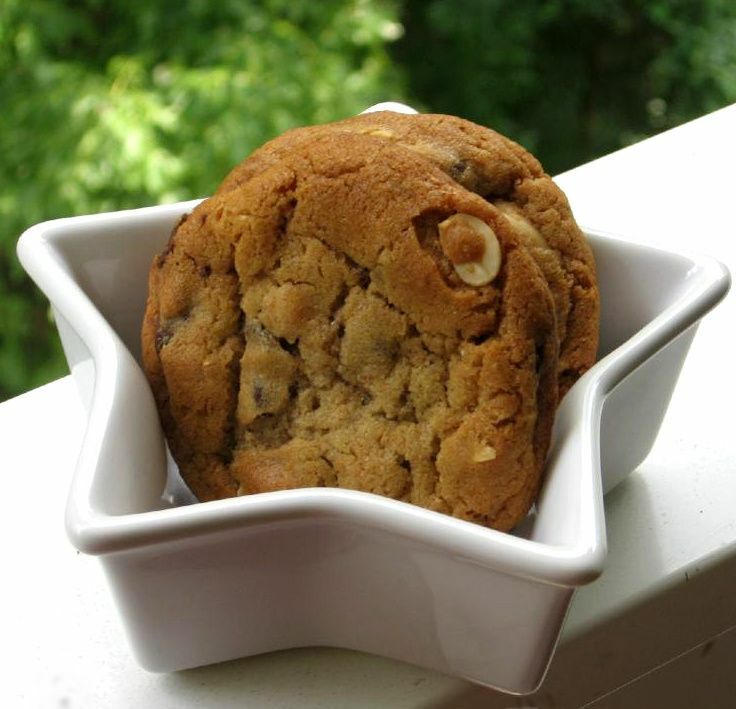 Fold in chocolate chips, peanuts, and vanilla with a mixing spoon until well distributed. Refrigerate dough until it is slightly firm, 15 minutes. If freezing, roll into logs using wax paper. 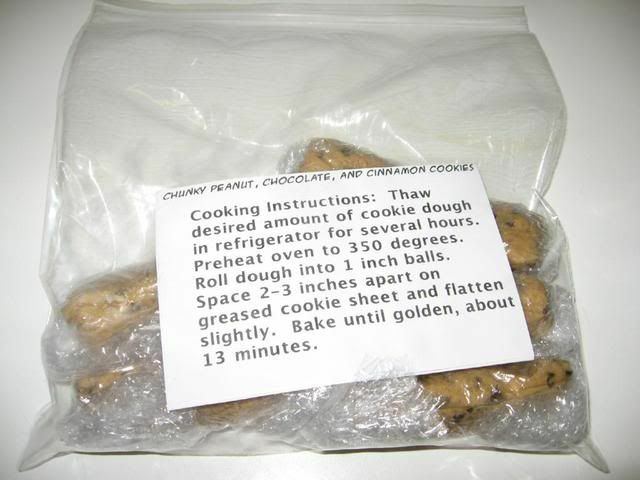 Double wrap logs of cookie dough (in desired portions) in plastic wrap and seal in a ziplock bag. Freeze for up to 6 weeks. Roll dough into 1-inch balls. Space balls 2 to 3 inches apart on baking sheets lined with parchment paper. Flatten slightly. Bake until just golden, about 13 minutes. Transfer cookies to wire racks to cool. Can serve with ice cream. 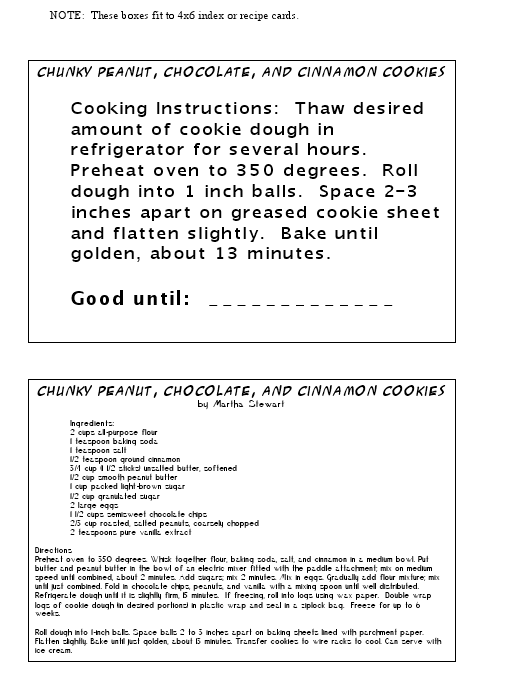 Thawing Instructions: Thaw desired amount of cookie dough in refrigerator for several hours. Preheat oven to 350 degrees. Roll dough into 1 inch balls. Space 2-3 inches apart on greased cookie sheet and flatten slightly. Bake until golden, about 13 minutes.